WW Solutions’ new 1,320 square metre facility at its on-port equipment processing centre (EPC) will enable Doosan to meet end-customer requirements without a hitch. 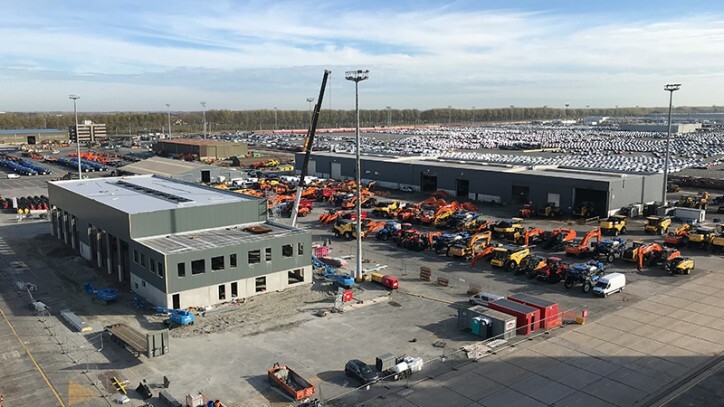 The expansion of a state-of-the-art equipment processing centre (EPC) in the port of Zeebrugge is helping manufacturer Doosan further capitalise on Northern European markets. By January 2020, the facility will be used to customise all Doosan machinery intended for Europe, with 3,000 machines predicted to pass through the workshop on an ongoing annual basis. The EPC will contain three overhead cranes – two with a 10-tonne capacity and one with a 20-tonne capacity – and modern warehousing systems, as well as a fully equipped production line for Stick and Boom assembly. With a floor strength capable of handling machines of up to 90 tonnes, the facility will be fitted with a new warehouse management system and will be run using Lean Manufacturing and Six Sigma project management methodologies. “We know that the ‘finish to order’ concept means that our OEM customers want to be able to deliver machines according to customer needs and specifications as quickly as possible,” says Antonio Essolito, WW Solutions General Manager Belgium EPC/VPC.